Find the area of a parallelogram with base 8 cm and altitude 4.5 cm. Find the altitude of a parallelogram whose area is 54 d m2 and base is 12 dm. The area of a rhombus is 28 m2. If its perimeter be 28 m, find its altitude. In Fig., ABCD is a parallelogram, DL ⊥ AB and DM ⊥ BC. If AB = 18 cm, BC =12 cm and DM= 9.3 cm, find DL. The longer side of a parallelogram is 54 cm and the corresponding altitude is 16 cm. If the altitude corresponding to the shorter side is 24 cm, find the length of the shorter side. ABCD is a parallelogram with the longer side AB = 54 cm and corresponding altitude AE = 16 cm. The shorter side is BC and the corresponding altitude is CF = 24 cm. We have two altitudes and two corresponding bases. Hence, the length of the shorter side BC = AD = 36 cm. In Fig. 21, ABCD is a parallelogram, DL ⊥ AB. If AB = 20 cm, AD = 13 cm and area of the parallelogram is 100 c m2, find AL. ABCD is a parallelogram with base AB = 20 cm and corresponding altitude DL. Hence, length of AL is 12 cm. In Fig. 21, if AB = 35 cm, AD= 20 cm and area of the parallelogram is 560 cm2, find LB. 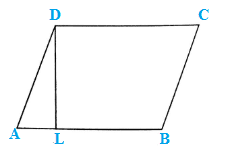 ABCD is a parallelogram with base AB = 35 cm and corresponding altitude DL. The adjacent side of the parallelogram AD = 20 cm. Hence, length of LB is 23 cm. The adjacent sides of a parallelogram are 10 m and 8 m. If the distance between the longer sides is 4 m, find the distance between the shorter sides. ABCD is a parallelogram with side AB = 10 m and corresponding altitude AE = 4 m.
The adjacent side AD = 8 m and the corresponding altitude is CF. Hence, the distance between the shorter sides is 5 m.
The base of a parallelogram is twice its height. If the area of the parallelogram is 512 cm2, find the base and height. Let the height of the parallelogram be x cm. Then the base of the parallelogram is 2x cm. Hence, base = 2x = 2 x 16 = 32 cm and height = x = 16 cm. Find the area of a rhombus having each side equal to 15 cm and one of whose diagonals is 24 cm. Let ABCD be the rhombus where diagonals intersect at 0. Then AB = 15 cm and AC = 24 cm. OA = ½(AC) = 12 cm and AB = 15 cm. Let ABCD be the rhombus whose diagonals intersect at 0. Then AB = 20 cm and AC = 24 cm. The length of a side of a square field is 4 m. What will be the altitude of the rhombus, if the area of the rhombus is equal to the square field and one of its diagonals is 2 m? We know that the diagonals of a rhombus are perpendicular bisectors of each other. Side of a rhombus = AB = √65 m.
Let DX be the altitude. Hence, the altitude of the rhombus will be 16/√65 m.
Two sides of a parallelogram are 20 cm and 25 cm. If the altitude corresponding to the sides of length 25 cm is 10 cm, find the altitude corresponding to the other pair of sides. ABCD is a parallelogram with longer side AB = 25 cm and altitude AE = 10 cm. As ABCD is a parallelogram. Hence AB = CD (opposite sides of parallelogram are equal). The shorter side is AD = 20 cm and the corresponding altitude is CF. Hence, the altitude corresponding to the other pair of the side AD is 12.5 cm. The base and corresponding altitude of a parallelogram are 10 cm and 12 cm respectively. If the other altitude is 8 cm, find the length of the other pair of parallel sides. ABCD is a parallelogram with side AB = CD = 10 cm (Opposite sides of parallelogram are equal) and corresponding altitude AM = 12 cm. The other side is AD and the corresponding altitude is CN = 8 cm. Hence, the length of the other pair of the parallel side = 15 cm. A floral design on the floor of a building consists of 280 tiles. Each tile is in the shape of a parallelogram of altitude 3 cm and base 5 cm. Find the cost of polishing the design at the rate of 50 paise per cm2.